While the presidential race remains close, it’s becoming clear that one would rather be President Obama than Mitt Romney at this point in the race. That’s because Obama retains a small lead in the polls, and history tells us that candidates leading at this point in the race often keep their leads. Notes: The three races with three poll results listed in parentheses account for George Wallace (1968), John Anderson (1980) and Ross Perot (1992). All polls listed are of registered voters. The most obvious conclusion we can make from these data is that it’s better to be ahead at this point. Of the 15 elections between 1952 and 2008, only twice has a candidate who held a lead around this time failed to win the election. However, Obama’s reelection isn’t exactly assured. A one-point lead is really nothing in a poll, and the economy remains poor. 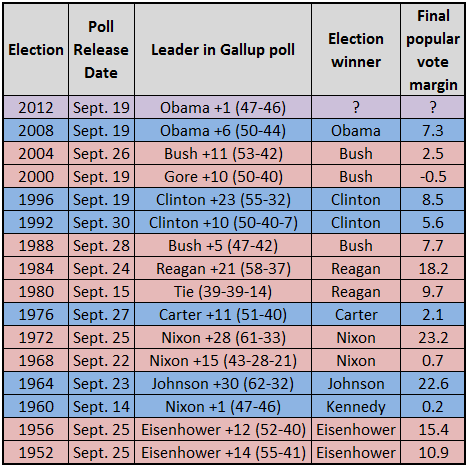 Only one other incumbent has been in a worse-off position in Gallup: Jimmy Carter was tied with Ronald Reagan in 1980. Given the November result for Carter, this isn’t the kind of company Obama would like to keep. In elections not involving significant third party candidates, the only election polling as close as this one was the Richard Nixon-John F. Kennedy clash in 1960. The Sept. 14 survey release that year found Nixon up by only one point, clearly within the margin of error. Considering that Kennedy only won the popular vote by about two-tenths of a percentage point, that race ended up being as close as it looked in mid-September, just with the Massachusetts senator holding the upper hand. If there is one poll that sticks out on this chart, it has to be the 2000 poll showing Al Gore holding a 10-point lead over eventual winner George W. Bush (though Gore did narrowly win the popular vote in the end). But if we take a closer look at the polls from 2000, just four days later Bush retook the lead by a point. This quick change is indicative of how the electorate in 2000 fluctuated much more than the current one. From Gore leading by 10 on Sept. 19, Gallup’s poll showed Bush up seven among registered voters on Oct. 26. Bush ended up losing the popular vote by 0.5% on Nov. 7. Compare those fluctuations to the 2012 cycle — since April, Gallup’s numbers have never showed Obama above 50% or Romney below 42%, indicating just how locked-in most voters are to backing one side or the other. And that of course is the danger of making historical comparisons. The electoral conditions of each election are unique, as are the voters themselves. History doesn’t actually repeat itself. This year’s election will take place under highly polarized circumstances, different from those in 2000 but not highly distinct from 2004 (or even 2008). Still, our best understanding of elections lie in analysis of the past. The simplest way of looking at the present situation in an historical context is to say this: President Obama should be pleased that he’s holding the lead. But don’t start counting chickens.